Lavender was said to be one of the plants most loved by the Blessed Virgin because it represented purity, cleanliness and virtue. 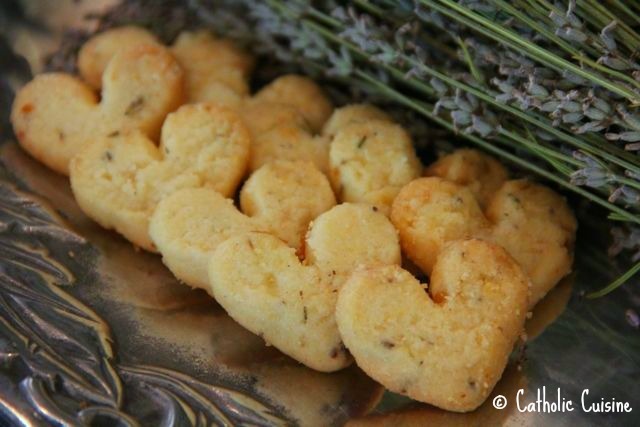 I purchased the cookies pictured above at a local Lavender Farm last week, and they were a perfect afternoon treat to give the kids on the (traditional) feast of the Immaculate Heart this past Wednesday, after sharing the legend of lavender with them. Since the whole month of August is dedicated to the Immaculate Heart of Mary, and since I happened to pick a bunch of lavender as well, I think we might try and make some more of our own using a recipe from Better Homes & Gardens. 1. In a medium bowl, combine flour, ground lavender buds, finely shredded lemon peel, and salt. In a large mixing bowl beat the 3/4 cup butter with an electric mixer on medium to high speed for 30 seconds. Add 1 cup powdered sugar. Beat until combined. Beat in as much of the flour mixture as you can with the mixer. Stir in any remaining flour mixture. 2. On a lightly floured surface, roll dough into a 10-inch-long log. Wrap log in plastic wrap or waxed paper. Chill for 2 to 24 hours or until firm. 3. Preheat oven to 350 degrees F. Cut roll into 1/4-inch slices. (We will probably then cut out heart shapes with a cookie cutter.) Place slices 2 inches apart on ungreased cookie sheet. Bake in preheated oven about 10 minutes or until edges are lightly browned. Transfer cookies to a wire rack and let cool. Makes 3 dozen cookies. In a small bowl, combine the 1/4 cup butter, 1 cup powdered sugar, and the milk. Beat with a wooden spoon until smooth. If necessary, stir in additional milk, 1 teaspoon at a time, to make a frosting of spreading consistency. Spread frosting on tops of cookies and, if desired, garnish with additional lavender buds and thin strips of lemon peel. Note: If frosted, place in single layer in an airtight container; cover. Store at room temperature for up to 3 days. Or freeze unfrosted cookies for up to 3 months; thaw and frost. Elana's Pantry also has a recipe for Gluten Free Lemon Lavender Cookies! O Jesus, through the Immaculate Heart of Mary, I offer you my prayers, works, joys, and suffering of this day in union with the Holy Sacrifice of the Mass throughout the world. I offer them for all the intentions of Your Sacred Heart: the salvation of souls, reparation for sins, the reunion of all Christians; I offer them for the intentions of our Bishops and of all Apostles of Prayer and in particular for those recommended by our Holy Father this month. I never knew that about lavender! It is my favorite. Thanks for sharing! I never liked lavender, until as a teen I encountered a real lavender plant while spending a summer in France. I tucked a sprig in my suitcase to bring home and for YEARS I enjoyed the frangrance from that single sprig! I wish I knew where it was now, for I'm sure I could still smell it's memories almost 30 years later! Thanks for the trip down memory lane and connecting it with Mary and Jesus. NOW I know why the fresh lavender instantly became a favorite scent!